Filed to: Mock One? Mach 1!Filed to: Mock One? Mach 1! I've had the opportunity to see him around the pony shows from time to time, but only in the car pictured above. 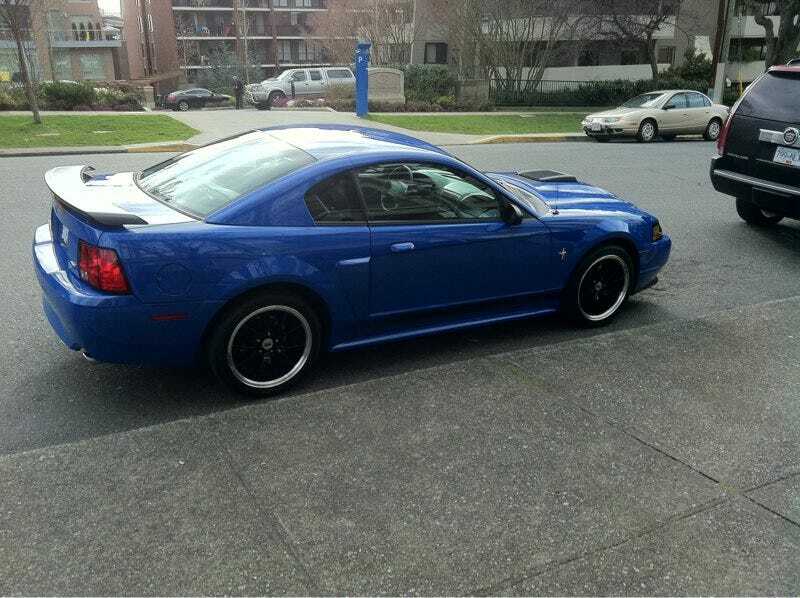 This is a shame because he also has another Mach 1, of the same year, in Torch Red. This one is chock full of performance parts while the blue beast remains mostly stock. They're gorgeous cars. They both live in a garage and only see road use in the summer months. To call these Mach 1's, even though they are 03's, would be an understatement. This hurt. This hurt badly. Why? Because when we met I tried to convince him to sell one, to sell it to me. Take my 06, I said. Or let me sell it and throw that at you, I pleaded. Nope. He's never gonna sell them, says he. Two Mach 1's for sale, one of which would have been within my bracket. But now? Nope. Why? Oh, kid is on the way y'know and it's our first. Somehow, while wifey is all swollen with our child, I don't think she'd abide me trading down ("down" being her opinion, not mine). So, I'm just going to quietly cry into my corn-flakes and hope that some Opponaut finds a way to cheer me up.